Hi there, this is the first of many blogs I’ll be writing on lifestyle trends. Right now I’m in Key West, Florida where I spend two and a half months in the winter. There are lots of Nantucketers here and we see each other often when we’re not working as hard as we do on Nantucket during the summer. Dress formal is wearing shorts and a clean shirt. I’ve got casual (translation: easy) entertaining down pat. Here are 10 of my favorite ways to set a table and serve a meal that translates from tropical lifestyle to Nantucket summer get-togethers. Tonight I’m having 7 for a chicken dinner on the grill with mashed potatoes ala Al Forno’s cookbook (the famous Providence restaurant) and stir fried veggies. Keep it simple but good and you can’t miss. A little bit of kitch adds a bit of kick especially when it creates subtle lighting outdoors. Everyone here wraps trees with tiny fairy lights – the kind you string on a Christmas tree. 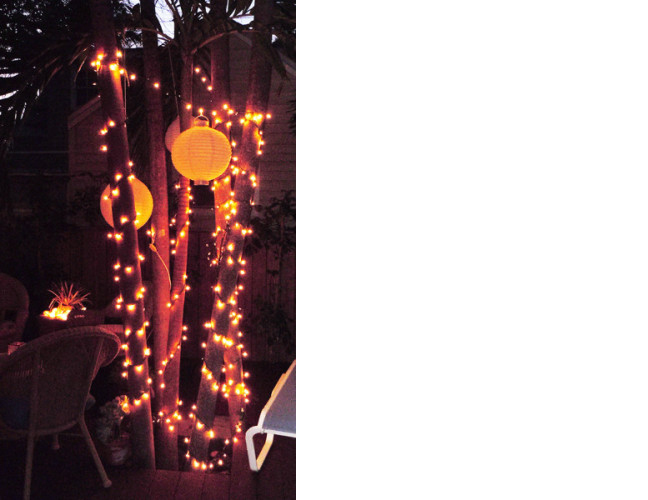 Hang white paper globes from tree branches for fun – hang in threes. I always bring strands of Nantucket scallop lights with me. Simply bunch them up on a little table to create a puddle of soft lighting in one spot. Doesn’t everyone travel with tablecloths and napkins? 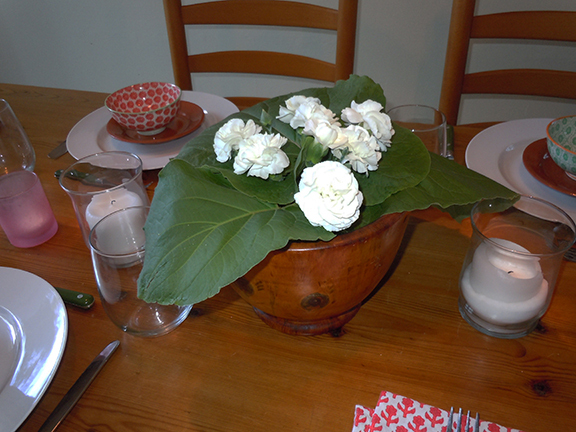 I’m a little obsessive but I like to set a nice table and don’t trust what’s in my rental house. Here’s my table with no placemats and the same pattern napkins in different colors. Keep flowers low and candles both high and low. Do not obstruct views. TIP} If you’re buying a new table, round always works best. Less formal and more conducive to conversation that includes everyone. 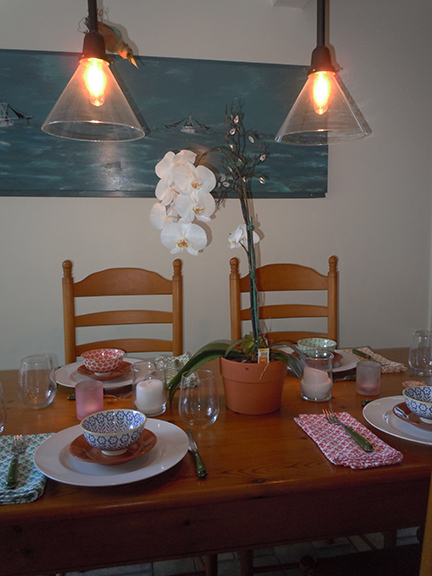 Put votive candles at random all over the table, center and at each place. 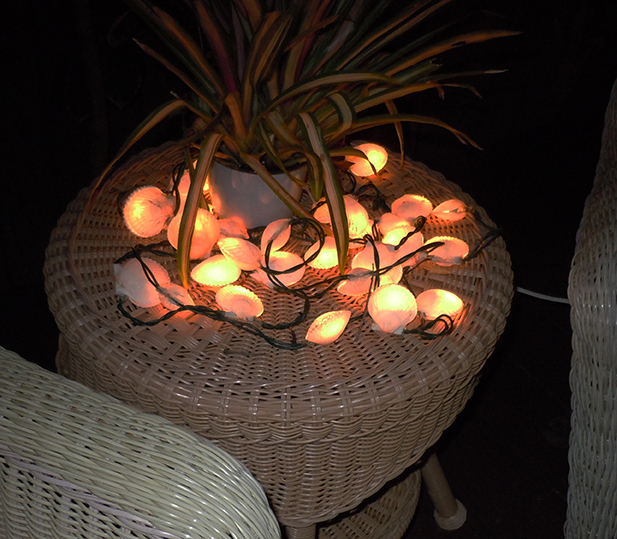 Lots of candles outdoors eliminates the need for any other lighting. Pick a theme. Last week I used roses. 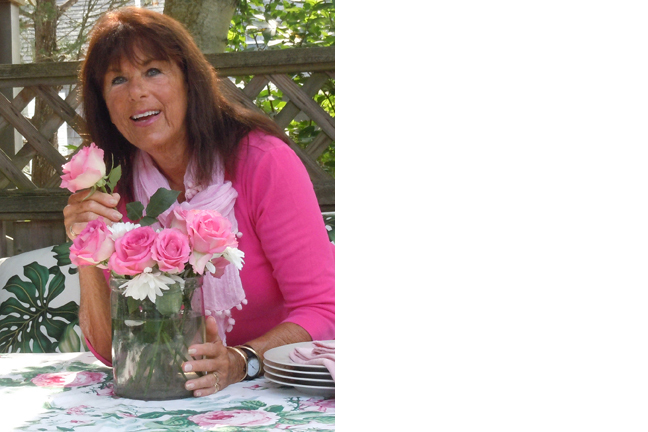 A piece of rose print fabric on the table, pink napkins and a fat bouquet of roses in the center. Orchids are outstanding. Probably the best flower in the entire world because it’s so elegant, you can see around it and you don’t have to keep buying cut flowers every time you have a party. It’s just there. One time cost! Down here it’s the flower of choice. Always white. White chinaware. Everything else can be colorful. Besides if one breaks you can easily replace it or add to what you have if you expand the group. Love handmade bowls that are colorful and gutsy and look native. Mismatched! Stemless glasses for all drinks. They’re casual and still elegant, more current than regular wine glasses. And you don’t need a slew of glasses in different sizes. These work with any drinks. Casual entertaining should be seamless. It takes a bit of thought and practice to get this right, but it’s worth the effort. If you’re working hard your guests can’t relax. When the host seems to entertain as if it’s second nature and everything turns out well, everyone has the best time. Steve and JoAnn Marcoux are down here as are Liz and Todd Winship. (Nantucket Looms). Each week one of us makes dinner for all. Since none of us owns the houses we’re in, it’s a challenge. Cooking a meal, setting a nice table and doing it with ease without your own familiar stuff means compromise. We are an inventive bunch using what’s on hand to invent a new style. Some of you may find yourself in this position while on vacation in Nantucket. Key West is known for its pink shrimp called Key West gold and this is shrimp season. For the past week I’ve endured, or rather agreed to eat shrimp every night so that my husband, Jon can perfect this dish for company. He’s tried local rubs and a variety of recipes from local food writers in order to easily and elegantly serve a really great but simple and, more importantly, simply made dinner for guests. I have been the guinea pig and we aren’t yet satisfied that it’s good enough for company. Casual serving of good food in a tasteful setting is the key to great entertaining! And nothing beats a good mix of people.